LOS ANGELES – The Antelope Valley tied with the Metro Region of Los Angeles County for having the highest rate of reported hate crimes per population in 2012. This, according to the Los Angeles County Commission on Human Relations (LACCHR), which just released its annual account of hate crimes reported throughout Los Angeles County. Read the full report here. In 2012, the largest number of reported hate crimes (105) occurred in the Metro Region (spanning from West Hollywood to Boyle Heights). Meanwhile, the Antelope Valley, which includes Lancaster, Palmdale, Quartz Hill, Littlerock, Lake Los Angeles, Acton and Gorman, had a total of 31 hate crimes in 2012. When accounting for population, the Antelope Valley tied with the Metro Region at 8.3 reported hate crimes per 100,000 residents, the highest rate of hate crimes. Overall, hate crimes reported in Los Angeles County in 2012 declined 6%, from 489 to 462, the second lowest number in 23 years. Similar to past years, four groups constituted 86% of all hate crime victims in 2012: African Americans, lesbians and gay men, Jews, and Latinos. Blacks were targeted most frequently by Latinos (68%), followed by whites (31%). Latinos were targeted by blacks (58%), followed by whites (29%). Gang members committed a high percentage of these crimes. Sexual orientation attacks constituted 28% of hate crimes, and they were more likely to be of a violent nature, with gay men being targeted in 91% of these cases. 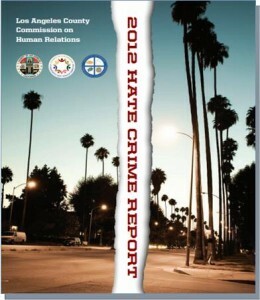 The 2012 Hate Crime Report detailed three of the 31 reported hate crimes in the Antelope Valley. July 24, Palmdale—Two black victims (one who identifies as gay and the other as a transgender woman) were eating in a fast-food restaurant. Three black males and one black female approached them and one of the men shouted, “You’re a f**kin’ fa***t! You should be a man!” The suspect repeatedly punched the gay victim. The victims ran away but were pursued by the suspects in a car driven by the female. The male suspects exited the car and continued to beat the gay male victim. Not detailed in the report was a racially-motivated incident that occurred at the Antelope Valley Mall on June 9, 2012. Charles Earl Thompson and James Steven Fallon confronted two Black men in the parking lot, hurled racial slurs and threats at the men, and then chased the men with pocket knives, according to testimony at a preliminary hearing. Thompson hurled racial slurs at the responding deputy and kicked out the back window of his patrol car, according to the deputy’s testimony. Read more here. In July 2013, a jury found Thompson and Fallon guilty of hate crimes and multiple other offenses in connection with the incident, according to court records. The men are appealing their convictions. According to the 2012 Hate Crime Report, evidence of white supremacist ideology declined from 21% to 16% of all hate crimes. The great majority of these were crimes against property and were of a non-violent nature, the report states. To view the complete report, including hate crime maps, graphs and tables, click here. 7 comments for "Hate crimes decline in LA County, AV ranks first per capita"
“The whites hate everyone who is different from them”… someone that is different from me wrote that. Don’t put ‘all’ whites, ‘all’ blacks, or ‘all’ hispanics in the same category. There are a LOT of very caring whites, blacks, and hispanics in the AV. Focus on the good. Be nice! That’s a perfect way to put it. There is a trashy side of EVERY ethnicity. Love it or hate it, it’s 100% true. I didn’t put you or anyone else in that category. I did mention my experience showed definite exceptions to the STATEMENT MADE BY A YOUNG MAN BEHIND THE MEAT COUNTER of a local business. However, there sure are many people here willing to attack anyone who expresses any thought they do not share. In this day and age I find it still surprising that news casts, news prints keep enough of a word that you can tell what it says while beeping or astericking it out. What is the point? Kids of an age to read have most likely heard the words somewhere. It is not hard to figure out what the words say. Does it lessen the hurt in the words? Of course not! So just say them, just print them, just be honest about what was said. That or don’t mention them at all. Pending how old you are or if you listen to rock or rap, the radio has set out to bleep/ remove curse from songs, but if the sond contains the G. D. word in it they let that go through. In 2006, when I was looking for a house in the AV, I discovered a great little meat market. The young man behind the counter asked why I was moving here. I told him my reasons and he laughed. I told him I was looking forward to being in a small community with people who care about one another. People who were polite and looked out for their neighbors. He said, the Blacks hate the Whites and Mexicans. The Mexicans hate the Blacks and Whites. The Whites hate everyone who is different from them. I have found many exceptions to that statement, but overall feel he was spot on. Thanks kid behind the meat counter. I wish I would have listened. No surpirse here, sadly. Give peace a chance.